Sampling delicacies in a Peruvian village | Where to next? I promise to get around to telling you about the Great Day Out we had in the Sacred Valley near Cusco, but I keep getting side-tracked by the unexpected things we did before we started the ‘proper tour’. Our first stop was at the amazing Cochahuasi Animal Sanctuary, but then Herbert, our Pachamama guide, took us to his hometown of Pisaq. He’s mighty proud of Pisaq, and so he should be. There are some wonderful ruins (more about them soon), a huge and popular market, and an amazing bakery that was churning out roasted pig, bread and empanadas from the same enormous outdoor oven. 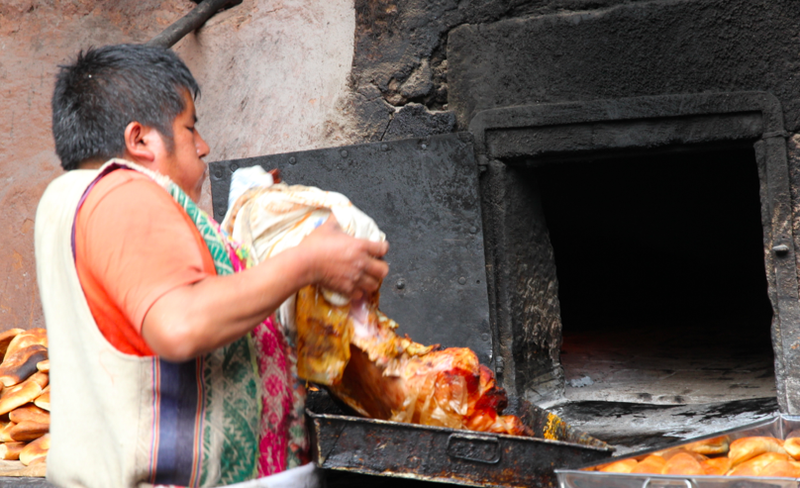 I’m a sucker for food—the name, the ingredients, how it’s made, how it’s cooked, how it’s eaten—and the Pisaq bakery was just a bit of bliss. To get there, Herbert directed our driver, Eduardo, down a bunch of super-narrow side streets (it always amazes me how we can snake through a labyrinth of alleyways and still end up at a largish square). We invaded the bakery first—sampling the sensational empanadas and the divine pork (whole pigs) being roasted for a wedding. 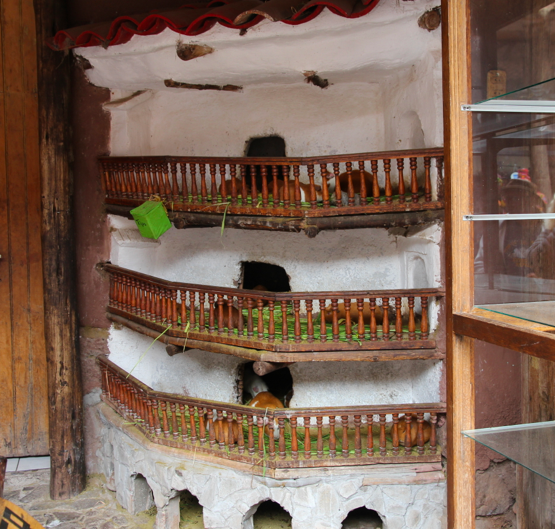 We checked out the guinea pig ‘hotel’ too, but none of them were being roasted this day. Then off to the market where I bought a couple of presents for our daughters (sorry, but no photos of the market or the pressies). It was the first real souvenir shopping I’d done in South America this time round, and I was rather pleased with my finds. Hope the girls are too. Then we were off to Ollantaytambo—the big guns of ruins. Stay tuned. P.S. Click on the photos to enlarge… nice photos of the oven and food! Thanks Sy. I meant to mention that, but I’m sitting in a cramped space in an airport. You’re so much appreciated. I know what you mean! I’ve tried guinea pig and alpaca too—for the experience. Great photos Peggy, I wish I would have been there with you and Poor John as well. Thanks so much! You would have loved this bakery! A corny start to Peru’s Sacred Valley | Where to next?